Breakfast. The most important meal of the day, yet how often do you skip it? While my husband and I often have smoothies for breakfast, sometimes I just don’t feel like making them. One of the most helpful things for me is to have something pre-made, especially if I know it’s going to be a busy week. That way, all the “thinking” for breakfast is done, the mess of making it is already taken care of, and it’s super easy to heat up. This week has been a busy week with having Vacation Bible School at our church, and next week my husband and I have our Teen VBS in the evening. I really want to make things easy for myself next week. 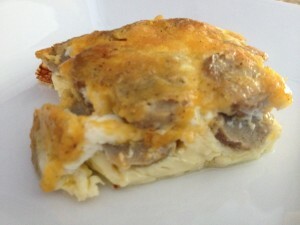 I plan on making an Easy Breakfast Casserole! I can make it on Sunday and we can eat it for breakfast the rest of the week. I love it because it only has four (yes 4) ingredients and takes barely any prep time at all! 1. Cut sausge links into small pieces. Grease a 9×13 baking dish. Spread the sausage over the bottom of the pan. Sprinkle with 1 cup of the cheese. 2. In a large bowl, whisk eggs and milk together. Pour mixture over sausage. Top with 1 to 1 1/2 cups of cheese. 3. Bake at 375 degrees for 40 minutes. The middle should not jiggle when you take it out! * You may use whatever cheese you like. I love using pepper jack sometimes to give it a little kick!! This entry was posted in Recipes and tagged breakfast casserole. Bookmark the permalink.